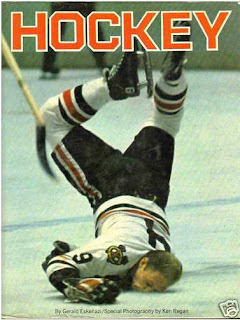 I once referred to the following title as "obscure" simply because I, a proud hockey book collector, had never seen it. "When it came out, it sold about 20,000 copies at a (then) pricey $12.95. It was, in fact, the first really good-looking, and serious, big picture book on the sport. Got big play in the Gazette, the Globe and Mail, The New York Times--and a host of radio and television appearances. That led to five other hockey books in quick succession. The book came out just as hockey was bouncing into the 20th Century, a bit late. Expansion was on its way (a few years later, I updated the book into "The Fastest Sport")." I have yet to see the book in person. The book features the photography of Ken Regan. Eskenazi wrote several other hockey books, including A Thinking Man's Guide To Pro Hockey, Hockey Is My Life (Phil Esposito's 1972 autobiography) and The Derek Sanderson Nobody Knows (1973). I actually have a beat up hard cover version of this book that my wife has been telling me to get rid of. I will never part with it! I just checked my library as I thought I had a copy. It's in very good condition. It has a dust jacket as well as a cover with same large photo as the DJ. Except for a few pages of colour photos at the front, the rest are black and white.